Tech. Sgt. 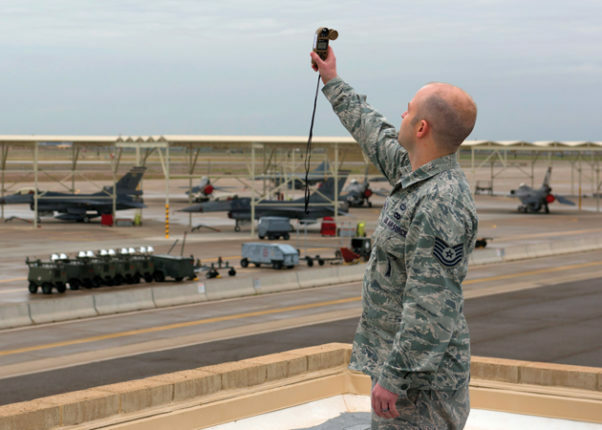 Sean Hilliard, 56th Operations Support Squadron Weather Flight craftsman, uses a Kestrel, a handheld wind and weather tracker, at Luke Air Force Base. Kestrels are used when the primary weather sensor malfunctions or becomes inaccurate. Flying missions take hours of preparation and one key aspect is considering how weather will impact pilots during flight. The 56th Operations Support Squadron Weather Flight tells fighter squadrons which routes are safe to fly with mission execution forecasts, detailed descriptions of weather conditions for the outlined mission. “We receive flying schedules from the fighter squadrons and tailor the forecast for them so when they conduct their operation planning they can plan their mission around the weather,” said Tech. Sgt. Sean Hilliard, 56th OSS weather craftsman. Creating the MEFs begin the day before the mission and continue at 3 a.m. the next morning, Hilliard said. The MEF is typically finalized at 6 a.m., a couple of hours before the pilots step to the aircraft. Weather hazards that could potentially affect a mission, including clouds, thunderstorms, ice and poor visibility, are included in the MEF. “The mission could proceed as planned, move locations, change start times or be cancelled based on our forecast and observations,” said Senior Airman Christopher Smith, 56th OSS weather journeyman. 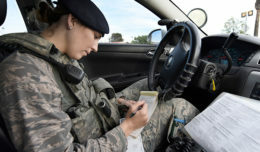 Weather Airmen also create terminal airfield forecasts, a 30-hour weather outlook, and distribute watches, warnings and advisory notifications to warn all base personnel of any approaching weather events. When a potential hazard is detected by satellite, Luke Airmen work in partnership with Davis-Monthan AFB to create a TAF that covers the regions surrounding the two bases and inform all base agencies of inclement weather, Smith said. 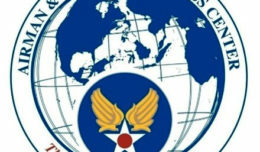 The weather flight must perform its role effectively for a mission to be completed successfully. “The most rewarding part of the job is seeing the direct impact of our forecasts in resource protection and in the safety of our pilots,” Smith said.